Since 2004 the Congress has hung on to power in a situation in which it was on track to be out of power. In each case, the Congress effectively gamed the system through Constitutional coups, argues columnist Rajeev Srinivasan. After Prime Minister Manmohan Singh's apparent swansong press conference, it is worth considering exactly how, under his tutelage, United Progressive Alliance-1 and 2 have fared. In the midst of scams and land-grabs, one remarkable fact stands out -- the curious incidents wherein Congress rule has continued against all the odds. The clever strategists of the Congress have managed to hang on to power despite everyone writing them off. The 2004 parliamentary election in which the Congress came to power surprised most observers. The National Democratic Alliance, and the chatterati, had expected the country, basking in almost-double-digit GDP growth, to return the NDA to power.. This was no landslide in favour of the Congress: it only got seven seats more than the BJP. It was the support of the Communists and some others that got the Congress to the magic number of 272.. Somehow, we have forgotten that fact because of the total freedom with which the Congress carried out its scams. Remarkably, we see the same forgetfulness in today's ecstatic reports about the Aam Aadmi Party: For instance the New York Times gushed about the AAP's 'commanding victory' in Delhi. Victory? Commanding? The AAP came second in a field of three! Such selective amnesia tells a lot about those doing the forgetting and their agendas. But the point is that the Congress was able to rope in the Communists in 2004 (they chose to give the Congress 'outside support') and run a minority government. Although we forget now, the gigantic scams began in UPA-1, not in UPA-2.. The 2G scam, the cash-for-votes scandal, etc took place during UPA-1. The Communists were indirectly culpable, thus, in the vandalisation of the economy on a large scale. But it was when the Communists threatened to pull the rug out from under them with the India-US nuclear 'deal' as backdrop that the Congress first rolled out its clever new tactic: The Constitutional coup..
To give credit where it is due -- and I am not exactly an admirer of the Congress -- the party has perfected the black art of Constitutional coups. What exactly is a Constitutional coup? Like a normal coup d'eat, it enables some group to take over a State; however, instead of violence, a Constitutional coup takes advantage of some loophole to effect a bloodless takeover, although it is indeed subverting the putative will of the people.. This is what happens when rulers manipulate election results -- for instance, it is alleged that Hun Sen did this in the Cambodian elections in 2013. The use of the Aam Aadmi Party as a fig leaf to retain effective power in Delhi in 2013. In each of these, the Congress has managed to hang on to, or to capture, power in a situation in which it was on track to be out of power. In each case, the party effectively gamed the system and subverted the checks and balances.. In addition, there is always a quality of mystery -- almost of the miraculous -- about the last-minute reprieve that the Congress got. Well, as they say, if something is too good to be true, it usually is. First, cash for votes. The minority UPA-1 government was on the verge of collapsing in 2008, when they went on a bribing spree, allegedly offering crores of rupees in cash to quite a few Opposition MPs.. This sting was caught on camera, and MPs brandished in Parliament the bundles of currency notes they were given. It appeared to be an open-and-shut case of perversion of the rules of parliamentary conduct.. The Speaker had just disqualified a couple of MPs for the relatively minor crime of taking money to ask specific questions; thus it appeared as though the impugned Congress politicians would be censured and prevented from voting. However, at the last minute, the Speaker refused to take cognisance of the alleged bribes; the television channel that had the tapes refused to broadcast them; and the Congress won the confidence vote. Truly miraculous indeed.. Yes, Constitutional coup number one -- the Constitution had been violated with impunity. Second, the 2009 election. Coming as it did just after the 26/11 terror attacks and hostage-taking by Pakistanis in Mumbai, one would have thought the Congress and its friends, who did such a poor job in managing the attack, and an even poorer one in forcing the Pakistanis to bring the handlers to justice, would have caused a backlash from the public. On the contrary, the Congress won more seats. There had been chatter on the Internet that a group of hackers had been recruited from the US to manipulate the Electronic Voting Machines.. Furthermore, strange things happened: Monu Nalapat, a journalist and professor, reported that he was able to find the results on the Election Commission page before counting started, and there has never been a satisfactory explanation for that. A major politician was trailing by 30,000 votes coming into the final stretch. Then, lo! an apparent miracle happened, and he won. There is a pending court case about this incident. EVMs are highly insecure, and for this reason the Germans, the Dutch and the Californians have all banned them. A few computer scientists figured out how to hack the Indian EVMs (they are quite primitive). Instead of being felicitated, one of them was jailed, for the absurd 'crime' of procuring an EVM (he was forced to, as the Election Commission wouldn't give him one to test).. Finally, the Supreme Court has forced the use of EVMs with a printed receipt to enable manual recounts if needed: A digital record is obviously not secure and can be spoofed. The computer scientists further showed that the EVMs could be decked out with a radio-sensitive chip, so that a person at some distance with a cellphone could trigger a Trojan Horse programme to quietly transfer votes to the preferred candidate.. Thus, the modus operandi could be simplified -- only a few compromised EVMs, and a few in-the-know people who could drive around to the compromised EVMs and enable the programme from their cars when nearby. If this suspicion is true, then the 2009 election may have been stolen. Constitutional coup number Two. Third, the strange case of B S Yeddyurappa. The Congress was extremely unhappy that the BJP -- viewed as a Hindi-cowbelt party -- had managed to gain a foothold in the South, thanks mostly to Yeddy's clever tactics. So what's a resourceful party to do? Non-stop harassment! . Governor H R Bharadwaj was sent to Bangalore with a single-point agenda: Get Yeddy out, by hook or by crook. So the governor and the Lokayukta hounded Yeddy, slapping all sorts of cases on him. The paid media got into the act, spilling oceans of ink on painting Yeddy as the biggest villain since, well... Al Capone. There was shrill, sanctimonious coverage of the Mangalore incident wherein a group called the Sri Rama Sene rescued some young women who were apparently being 'groomed'. In fact, Yeddy's alleged crimes (land grabs) were misdemeanours, easily topped by any one of felonies (CWG, 2G, Adarsh, etc) under Manmohan Singh's watch. Yet there was no uproar asking Singh to resign, unlike Yeddy..
By causing the BJP -- gullible BJP -- to expel him, and thus split the anti-Congress vote, the Congress was able to come back to power. Fiendishly clever. And now comes a Supreme Court judgment exonerating Yeddy. Why isn't Yeddy suing for defamation, character assassination and libel?. Anyway, the damage has been done and the BJP can no longer use Karnataka as a springboard into the rest of the South: Mission accomplished. Also, I didn't see anything but a very cursory report of the court ruling in the media. There is in fact very little coverage of Karnataka now -- I guess Omerta is the name of the game now that the Congress is ruling the state, and nothing bad is supposed to get publicity. Fourth, the curious case of the Aam Aadmi Party. Since the principal effect of the AAP entering politics is to split the anti-Congress vote, it is likely that there is some 'understanding' between the two parties. There were rumours of secret meetings in smoke-filled rooms. The alacrity with which the Congress supported an AAP power-grab, and the alacrity with which the latter accepted, suggest this was pre-planned. Constitutional coup Number Four. So, the AAP is a Congress proxy, and a particularly nasty embodiment of that motley crew called the NAC (National Advisory Council), which has created some of the most dangerous legislation in recent memory. If anything, the AAP is even more lunatic-Left than the NAC. Its policy pronouncements are startlingly bad, but clearly the Congress is not bothered, so long as they have prevented the BJP from ruling Delhi. Indeed, the foreign media has been singing the AAP song for a few months: The Economist, The New York Times, etc have been cheerleading for the AAP and Arvind Kejriwal. Which leads to the question of why they have so much benign interest in Indian politics all of a sudden. The curious incident of the dog in the night-time comes to mind. The Congress is, in effect, back in power in Delhi. All that has happened is that the unlamented Sheila Dikshit has been thrown under the bus. And the entire media apparatus is now full of starry-eyed stories about how wonderful the AAP is, and how their leader is going to defeat Narendra Modi by astroturfing an army of volunteers in major metros and eating into the anti-incumbency vote, thus paving the way for Rahul Gandhi to be anointed prime minister in May. The frightening thing is that this scenario may indeed happen: By virtue of clever tactics, the Congress may well steal 2014 more subtly than with downright EVM fraud. And that would be a sad day indeed.. In 2009, I predicted gloom and doom and the evisceration of the Indian economy. It turns out I was not pessimistic enough. But if UPA-3 becomes a reality, by 2025 India may well be Balkanised into a Greater Bangladesh, a seceding Northeast, a Kashmir ceded to Pakistan (Manmohan Singh hinted darkly about an 'important breakthrough' that he almost secured), an Arunachal Pradesh and Ladakh grabbed by China. And the Indian voter will have only himself to blame. 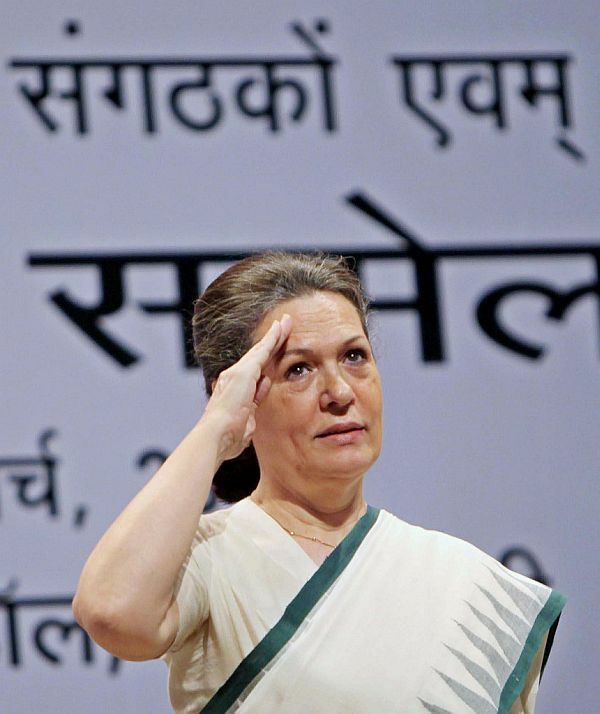 Image: Congress President Sonia Gandhi. The PM breaks his silence: Were you convinced?